Can we agree that fly fishing is an art form as much as a sport? For someone who hasn’t fly fished before, the thought of standing in a stream continually casting out for long periods of time can seem as strange as putting money into a bag with holes. But avid fly fishers know better. They know that the right fly cast the right way at the right spot can land some pretty incredible fish. The biggest challenge is selecting the right fly. There are literally dozens of different fly choices. There are flies for certain species of fish, as well as different flies for the same fish depending on where they are found. And, of course, there are flies for various seasons as well. So what is the inexperienced fly fishermen to do? Keep reading to find out. The first important lesson for every new fly fisherman or woman is to learn to identify local bugs. After all, flies are bugs. It is a good idea to take some time to visit your local waterways before you start loading up with rods and tackle, solely for the purpose of observation. A little observation goes a long way. What are you observing? The kinds of insects the fish are jumping for. Spending just a few hours per day for a few days in a row will reveal a lot. So take a pair of binoculars, paper and pencil to record some notes, and a willingness to spend some time watching. You can then look up the insects you see online to find out what they are. Next, you want to research the insects you observed in the wild. Learn what they are, how prevalent they are in your local area, when they are most abundant, etc. This will help you better understand how the insects behave during the different seasons of the year. Identifying the best insects throughout the year may require several recon missions. You may have to go out once in the spring, again at the start of summer, and one more time in the early fall. Remember that you are after different fish during each of the seasons, and those fish may prefer different insects. • Size – The size of your flies should be roughly equivalent to the insects you observed during your reconnaissance. And by the way, this rule applies to all kinds of artificial lures and baits meant to mimic their natural counterparts. If the size is off, the fish will know it. • Shape and Color – A close shape and color are as important to successful fly fishing as size. Once again, get them as close to the real thing as possible. • Action – The action of a specific fly is that which enables you to mimic an insect’s natural movement above the water. Choosing a fly with the right action is the hardest part of the process. For example, trying to imitate the natural action of mayflies requires a specific kind of fishing fly. If you’re not sure what kind of action to look for, ask somebody who already knows. It always takes time for new fly fishermen and women to fully understand how to select the right flies for every season. You are likely no exception. So while you are learning, avail yourself of any and all expert advice you can find. You might even consider signing on to a monthly fly subscription. BugClub.com is an example of one of the newest fly subscription services available. For an annual fee of $99, Bug Club members get access to all the expert advice they need along with a selection of new flies throughout the year. They also receive what the company calls the Braggin’ Rights Box, a box filled with fly fishing gear valued at more than $69. New members can cancel within 30 days without being charged the annual fee. Expert advice is invaluable in a sport that requires so much knowledge. 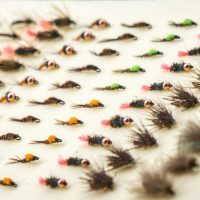 If you are new to fly fishing, take advantage of that advice as you gradually learn how to select the right flies for every season.